You may have what it takes to be a dog whisperer. Listen to John Spieser’s insight on this topic. John Spieser of dogheart, speaking from the Ambassadors for Dogs Training Seminar #1. This is a training series that trains people to advocate and then train dogs. “It’s like people training for dogs.” John gives his criteria for what it takes to be a dog whisperer. About a 42 second gem from the series! My neighbor’s Aussie who is a really nice dog exhibited some strong herding behavior while the owner was bike riding with her dog to get him some needed exercise. She did this the other day resulting in a catastrophe for herself. 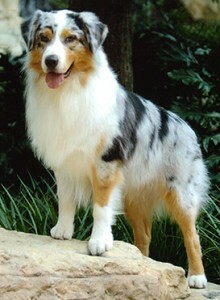 The dog owner, wanted to be able to get her dog a lot of much needed exercise for her Australian Shepherd. After training him to first walk well on a leash, she advanced to off leash walking. The dog is a very impressive walker, staying really close to his owner and has excellent recall. The next step was to ride around the neighborhood on bike with the dog nearby, yeilding lots of exercise for the dog. This was working really well until the dog decided that the bike tire needed to stay in place and started nipping at it while the owner was riding. Being a very persistent dog he pushed a little too hard and caused the bike riding owner to crash, hitting the sidewalk with a lot of force. This resulted in the owner breaking her arm, requiring surgery and either spraining or breaking her ankle too. Yikes!. I’m posting this as a warning to you that even the most well behaved dog can revert to its basic instincts and do something you might not be prepared for. I had followed the lead of my neighbor and took Sadie around the block a few times, but after my neighbor’s crash I decided that me being on foot was a safer option. 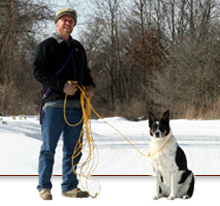 Find out how this owner trained her dog to walk well on a leash with the help of dog trainer John Spieser and the long line dog training method. Please write a get well comment for my neighbor Pam today. She’s having surgery to fix her broken arm. She will really appreciate the good will. Thanks. Ambassadors for Dogs has added a Facebook page. Our dog ambassadors are not necessarily great at facebook so if you can leave us some suggestions we’d appreciate it! We ask that you please become our fan. Add stories and pictures about you and your dog to the fan page. 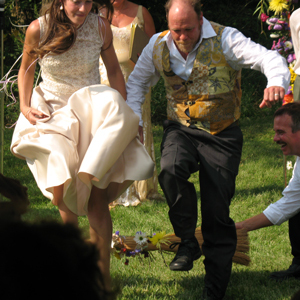 John Spieser and his new wife Liz jump over a broom at their recent summer wedding. 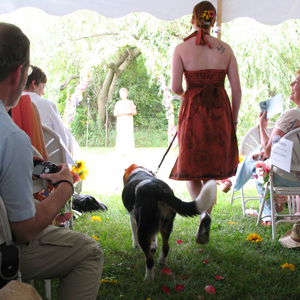 Patch, John’s dog was the ring bearer. Do You Yell at Your Dog? Don’t Do That. If you have a new puppy in the house and are unclear about whether or not you should use yelling as a way to get him to stop doing something wrong or barking too much, then this article should clear up your confusion. If anything, you should learn the simple fact that yelling at your dog it does nothing to fix a problem, stop what he’s doing, or induce any type of positive reinforcement. 2. The second tone of voice used when communicating with your dog is more of a direct tone as if you are talking to a colleague. A direct tone would be the same way you give commands to your puppy when you want to get his attention. It should be short, firm, and authoritative. 3. The third general tone of voice you can use with your dog is more of a disciplinary tone. However, you must learn to draw a fine line between a disciplinary tone and a yelling tone. Remember, you do not want to yell your dog but there are certainly times when you need to get across to him to back away from something quickly or to stop doing something immediately, all without actually scaring him off with shouting. Personally, I like to use two syllables such as “No Bark” or “Sadie Off”. Stay in charge and calm when using this tone of voice. Don’t get emotional. Maybe you can relate to this. You know, it was really frustrating for me to walk my dog Sadie when I brought her home from the pound. This neck pulling dog was a huge challenge to me. I had envisioned these nice walks we could take, both of us getting some exercise, but it just turned into a struggle all the time. She’d be pulling me down the street sniffing and whatever dogs do, and wouldn’t even pay attention to anything I said to her. I thought I could change this and I tried a choke chain. That worked for about one day until she got used to it. Then my neighbors started giving me all kinds of devices to put on her neck. One was a prong collar used for a dog twice her size and I really didn’t know how to use it. It basically fell off her so that didn’t work. Then I tried this thing that went over her muzzle and made her turn her head when I pulled it. She HATED that. Plus it was rubbing off all the fur on her face. So I passed on that. Then, I figured I’d just let her off her leash and let her go “free.” Big Mistake! I found out one of her favorite games was to play keep away – from me. And she’s one of the fastest dogs I’ve seen so there was no way I was going to catch her. So we went back to walks on the leash. I was getting very concerned because all the pulling was starting to damage her vocal chords. I could tell because her bark was getting hoarse. That was kind of sad and I mentioned it to my other neighbor, Pam. Pam reminded me of a dog trainer she knew that she was going to employ when she got a dog for herself. His name was John Spieser from dogheart. Well since I met John my life has changed and he has spurred me on to provide better information about dog training and how to build a connection with your dog through this blog and through the Ambassadors for Dogs training programs. Stay tuned for more. Last night John Spieser reviewed the dog training pyramid in his seminar Ambassadors for Dogs Part 2. This series of seminars should be used by dog training schools because it gives a person a tremendous background and foundational information about dog behavior, health, breeds and environment that need to be in place before successful training can take place. Anyone looking for dog training schools might want to investigate the quality of the teachings before signing up for a system of dog training that may be outdated or detrimental to the dog. John Spieser would be considered a new school dog trainer. He balances compassion for the dog with obedience required from the dog in his methods. Old school dog trainers rely more heavily on discipline and use discipline when it is not necessary. One dog training video that was recently reviewed showed the dog trainer using invasive equipment on a small puppy. It is unnecessary to use anything more than a flat collar when training new puppy. The puppy doesn’t know anything yet and hasn’t learned any bad behaviors. It’s easy to teach a young pup how to come using a long line and his flat collar if done correctly. There is no need for any command collars or flat collars ot this time. Also, other dog training schools advocate the use of food rewards in dog or puppy training. This can be overdone. If you are basically bribing a dog to do something for a treat, then the dog is training you. Giving a dog an unexpected treat for appropriate behavior is acceptable. 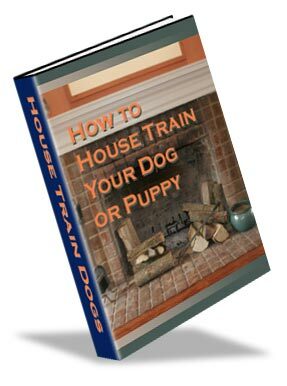 I will get the dog training pyramid up for your review. Also we’ll be making the entire 4 hour Ambassadors for Dogs training series available in a few weeks. The seminars will continue covering valuable information regarding the shaping of your dog or puppy’s behavior. And I will be sharing portions with you on this site. If you are considering finding dog training schools to teach you about dog training then you’ll want to see for yourself every Ambassadors for Dogs dog training video. John Spieser balances compassion and discipline in dog training reflecting the well adjusted mother dog’s behavior towards her pups. No matter how good or bad your dog behaves you’ll probably need to manage your dog’s behavior at some point in time. Some may require continued management for best dog behavior. So what does this mean? It means paying attention to your dog’s bad behaviors, pulling on the leash, counter surfing, raiding the garbage, getting on the couch or peeing on the floor. If your dog does anything you don’t approve of you need to manage his behavior. One very easy way to manage a dog’s behavior is to never let him out of site in your house. It may seem silly, but keeping your dog on a leash, inside your house can prevent him from sneaking into your closet to chew up your new shoes, or peeing on your bed. The crate is also a great place to put your dog for part of the day if he is causing trouble or can not be watched carefully. Do you leave food on the counter in the kitchen when yo know your dog had a propensity to counter surf? Well don’t do that. Keep your dog out of the kitchen unattended or put him outside or in his crate during meal prep time. You need to manage your dog’s behavior and where-abouts to control the outcome in your home. Don’t be afraid to use a leash on your dog inside your house is warranted. Your dog will learn that it is pointless to misbehave is he is never rewarded by allowing a bad behavior to continue. A dog pulling on a leash is another bad dog behavior that should never be tolerated. 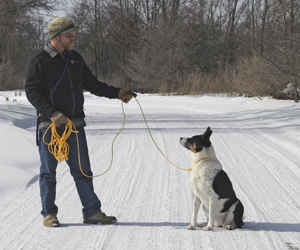 Learn how one dog trainer uses two commands and an inexpensive training device to teach a dog to stop pulling on the leash.